Thermal energy from the sun can be stored as chemical energy in a process called solar thermochemical energy storage (TCES). The thermal energy is used to drive a reversible endothermic chemical reaction, storing the energy as chemical potential. During periods of high solar insolation, an energy-consuming reaction stores the thermal energy in chemical bonds; when energy is needed, the reverse reaction recombines the chemical reactants and releases energy. Incorporating storage into concentrating solar power (CSP) systems enables dispatchable generation, whereby utilities produce power to match demand. This efficient method of power production overcomes intermittency challenges faced by other forms of renewable energy production. It also reduces the cost of solar energy through higher utilization. Thermochemical storage has inherently higher energy density than latent- or sensible-heat storage schemes because, in addition to sensible heat, energy is stored as chemical potential. The endothermic reactions that could be employed for solar TCES can operate at significantly higher temperatures than current state-of-the-art CSP storage systems (e.g., molten salt storage). Higher-temperature operation enables the use of high-efficiency power cycles. A storage scheme with higher energy density and higher power cycle efficiency could greatly reduce the cost of solar-derived power. The challenge in developing solar TCES, however, is in achieving high enough energy and power density to offset increasingly complex process control, service life, and material compatibility issues inherent in the use of a high-temperature, chemically reactive system. Global CSP capacity is still small compared to other renewable energy technologies, but it has been expanding with an annual growth rate of about 40% since 2006 (Figure 1). Breakthroughs in storage technologies could help to increase CSP’s share of the energy portfolio. ▲Figure 1. 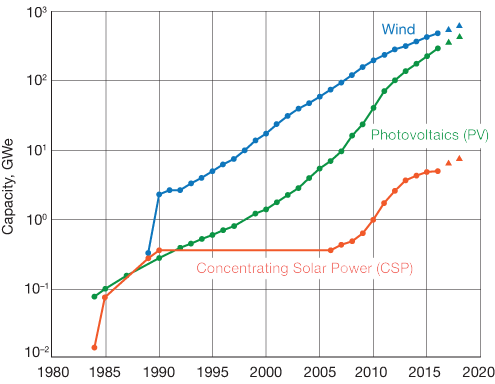 From 1990 to 2005, wind and photovoltaics (PV) were deployed at much higher rates than concentrating solar power (CSP). Since then, the growth curve for CSP has begun to more closely mirror those other forms of renewable energy. Data courtesy John Pye. Incorporating solar TCES into CSP installations requires integration of an additional subsystem — essentially a chemical plant for the reversible energy storage reaction(s). The subsystem receives heat from the solar collection field, which it can use to drive the endothermic energy storage reaction when power is not in demand. Because the purpose of the chemical process is energy storage, a critical component of the subsystem is the storage tanks. 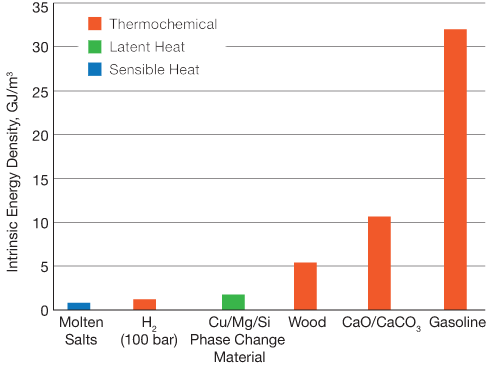 Thermochemical storage mechanisms have a higher energy density than thermal methods, which could help lower capital costs by reducing storage tank volumes (Figure 2). ▲Figure 2. The energy density of thermochemical storage is inherently higher than sensible or latent energy storage because energy is stored as chemical potential. When energy is required from storage, the TCES subsystem delivers heat to the power block. The reactants must contact each other to react, while heat is simultaneously extracted and sent to the power block. In an ideal design, the heat-transfer fluid would also be a reactant (e.g., a gas) that would directly contact the other reactant(s), such as in a packed-bed reactor. Solar TCES subsystems are classified as direct or indirect (Figure 3). In a direct solar TCES subsystem, the endothermic reactor receives heat directly from the solar receiver, while in an indirect subsystem, the endothermic reactor receives heat from the solar collection field via a heat-transfer fluid. 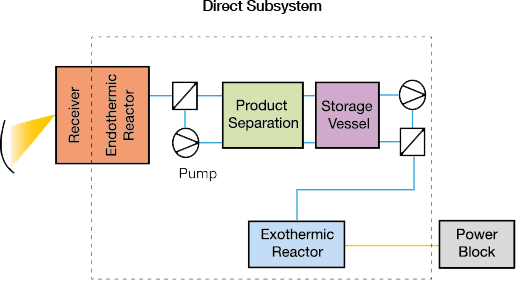 The receiver and reactor are coupled in a direct subsystem; heat-transfer fluids for extreme temperatures may not be available or practical for some processes. ▲Figure 3. 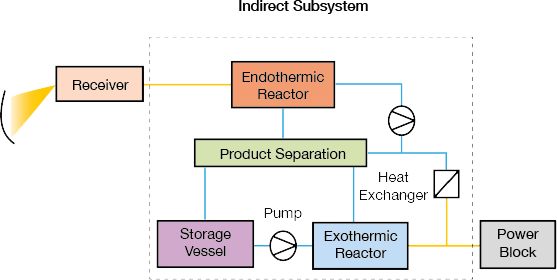 Direct subsystems (left) combine the receiver and endothermic reactor in the same vessel. In an indirect subsystem (right), a heat-transfer fluid transports heat from the receiver to the endothermic reactor. In both designs, the exothermic reactor exchanges heat with a power block when power is in demand. Source: Adapted from (2). Although heliostat-tower (i.e., power tower or central receiver with heliostats) collectors are often associated with solar TCES, TCES could conceivably be implemented with both dish and trough designs, depending on the process temperature requirements. Subsystems might include intermediate separators, heat exchangers, and storage vessels related to the type of chemical reaction used. For example, a metal oxide gas/particle TCES subsystem would include a reduction reactor (for storage when the sun is shining), a cyclone separator (or similar equipment) to separate the charged particles from the hot gas, heat exchangers for heat recovery and heat delivery to the power block, an oxidation reactor (to produce energy when the sun is not shining), and integrated storage vessels that minimize heat losses and the distance extremely hot gas/particles must travel. Simple chemical reactions that avoid or minimize the need for complicated separation steps would be expected to have the highest energy and exergy efficiencies. Most CSP installations use steam Rankine cycles to convert thermal energy to electrical energy, but there are some efforts to explore the use of organic Rankine cycles. Existing Rankine systems typically employ a molten salt storage system. CSP installations with molten salt storage operate at about 600°C, which limits the choice of power block and limits the achievable thermal efficiencies to about 40%. The development of noncorrosive salts or TCES systems capable of operating at higher temperatures is an active area of research that could unlock the use of higher-efficiency power block arrangements, such as combined cycles or supercritical CO2 (sCO2) cycles. Combined cycle power systems, composed of a Brayton (air) cycle followed by a Rankine (steam) cycle, are currently employed commercially for electricity generation. They achieve thermal efficiencies of 50–60% and operate at temperatures of 800–1,500°C.